And Help Us Reach 2,500 More Architects and Engineers! 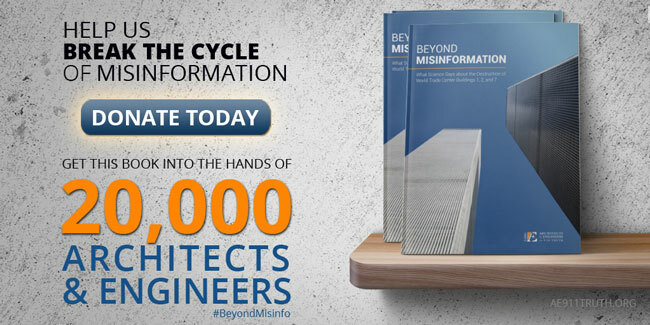 We’re in the final stretch of the fundraising drive that will enable us to mail our new WTC evidence guide to 20,000 architects and engineers this September. So far, we’ve raised $44,000 of our $50,000 goal, allowing us to reach 17,500 architects and engineers across the United States! We are amazed and very grateful for the level of enthusiasm this project has generated. If you’d like to help, please make a donation this weekend so that we can raise the final $6,000. 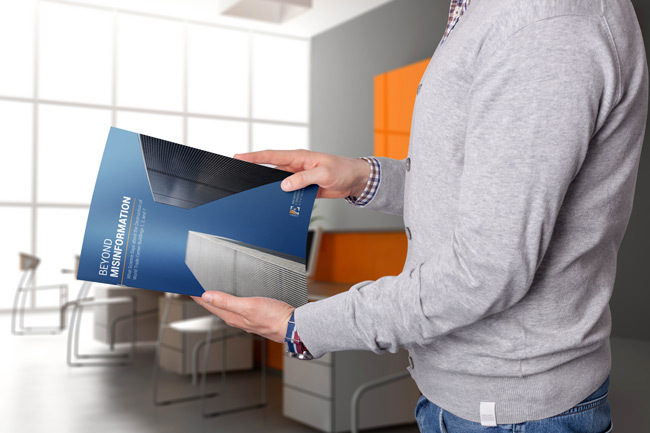 This will enable us to send the booklet to an additional 2,500 architects and engineers — and to you, too, if you donate $30 or more ($35 for non-U.S. residents)! To help us ensure that Beyond Misinformation contains only the best evidence and analysis, we’ve assembled a review committee consisting of nine AE911Truth petition signers and respected 9/11 researchers. We’re tremendously grateful to them for giving their time and talent to make this new booklet the best that it can be. Sarah Chaplin, an architect and urban development consultant in the United Kingdom, former head of the School of Architecture and Landscape at Kingston University, and a published author of many books and articles on urbanism and cities. Dr. Mohibullah Durrani, a professor of Engineering and Physics at Montgomery College in Maryland with decades of experience in the nuclear, automotive, and printing industries. Richard Gage, a San Francisco Bay Area architect, a member of the American Institute of Architects, and the founder and CEO of Architects & Engineers for 9/11 Truth. Dr. Robert Korol, a professor emeritus of Civil Engineering at McMaster University, a member and former Chair of the Sustainable Development Committee of the Canadian Society of Civil Engineering (CSCE), and a fellow of the CSCE. Dr. Graeme MacQueen co-editor of the Journal of 9/11 Studies and a retired professor of Religious Studies and Peace Studies at McMaster University, where he taught for 30 years and founded the Centre for Peace Studies. Robert McCoy, who has been a licensed architect in California since 1964. Most of his experience has been in multi-story, steel-framed, high-rise buildings, including the 34-story PG&E headquarters and the 44-story Standard Oil headquarters in San Francisco. Kathleen McGrade, an engineer with expertise in materials science who has worked in three engineering/science-related start-ups and now owns a company that inspects and tests fire trucks in California and Colorado. Edward Munyak, a registered mechanical and fire protection engineer who currently works for the City of San Jose, California, and who has made presentations on the WTC disaster at the NFPA World Safety Conference for continuing education credits. Oswald Rendon-Herrero, a professor emeritus of Civil and Environmental Engineering at Mississippi State, a member of the ASCE’s Technical Council on Forensic Engineering, and an associate editor of the ASCE’s Journal of Performance of Constructed Facilities. Thanks in large part to this wonderful group of architects, engineers, and researchers, Beyond Misinformation will be a powerful educational tool useful for many years to come. Let’s kick it off this September by getting it into the hands of as many architects and engineers as possible!